VDNKh, an architectural ensemble of the Soviet period, is to serve as the main theme of the Russian exposition at the Biennale in Venice. The architectural ensemble of Moscow’s famous Soviet-era exhibition center will be the main theme of the Russian pavilion at the Venice Biennale, where it will star in a multimedia exposition. VDNKh, an architectural ensemble of the Soviet period, is to serve as the main theme of the Russian exposition at the Biennale in Venice. The multimedia exhibition is designed for a wide audience, not only for architecture experts, the curator of the Russian pavilion, Sergei Kuznetsov, said at the project presentation in Moscow on March 28. After the Biennale, the exposition will travel to one of the central pavilions of VDNKh in Moscow. VDNKh stands for Exhibition of Achievements of National Economy. One of the main monuments of Soviet architecture, it combines elements of avant-garde with Stalinist empire style and modernist architecture. It comprises a huge park with pavilions, representing a total surface area of 520 hectares, built in the likeness of the Venice Giardini. It opened in 1939 in the north of Moscow with an eye to demonstrate the power of collective farming in the USSR. A monument installed here – Worker and Kolkhoz Woman by Vera Mukhina and Boris Iofan – also became symbolic for VDNKh. First shown at the 1937 World Fair in Paris, it was hailed there as one of the greatest sculptures of the 20th century. The pavilions of VDNKh, designed by prominent Soviet architects (Vladimir Shchuko, Vyacheslav Oltarzhevsky and Vladimir Gelfreich are among them) housed not only a variety of thematic exhibits, but also a kind of representation of the different Soviet republics. Exhibition halls, shops and cafes are in plenty to be found in the pavilions of the Exposition Center. There is also a park for leisure and recreation. 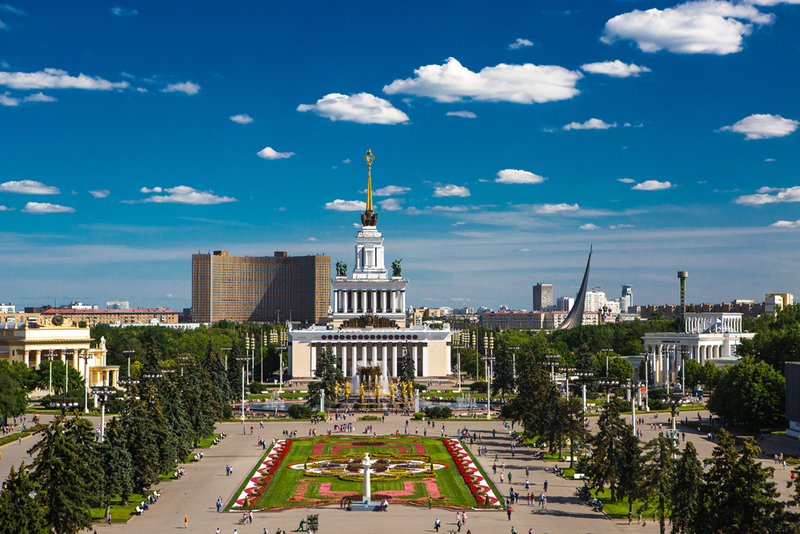 "The architectural ensemble of VDNKh still attracts a lot of visitors today. You might call it our ‘Roman Forum.’ When architects see it, they get excited," said Semyon Mikhailovsky, rector of the St. Petersburg State Academy of Painting, Sculpture and Architecture and the commissioner of the Russian pavilion at the Venice Biennale. According to the curator of the exhibition, the five halls of the Russian pavilion in Venice will tell the story of VDNKh as a synthesis of different arts (leading architects, designers, sculptors and artists contributed to the creation of the ensemble) from its establishment until the modern day. Who else from Russia is taking part in the Biennale? Alejandro Aravena, Pritzker Architecture Prize laureate, is curating the main project of the Venice Biennale, called “Reporting from the Front.” A total of 88 architects from 37 countries will take part in this project, including two Russians – Alexander Brodsky and Boris Bernasconi, curator of the Russian pavilion at Expo 2010. The Venice Biennale will take place from May 28 to Nov. 27, 2016.